whether you paid $10.00 or $200.00 for your home sharpener it was only designed to do 50% of the job and that's why the majority of these sharpeners are gathering dust in a kitchen pantry somewhere. Well now you can dust that expensive sharpener off! 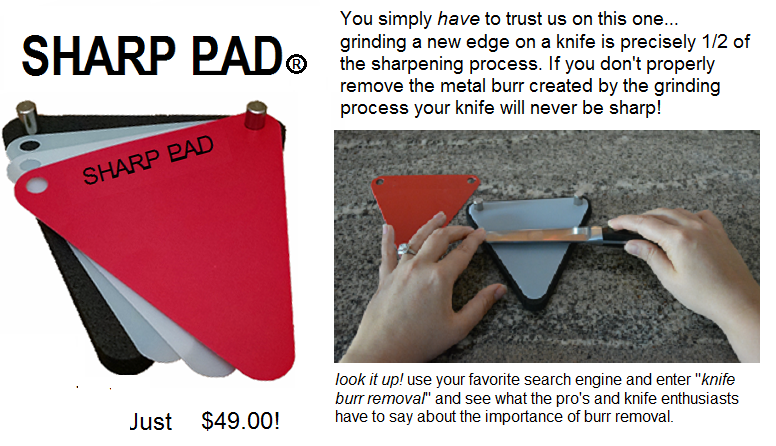 If it's still capable of grinding a new edge on a knife we can team it up with a SHARP PAD and start doing the whole job instead of a half-job. Whenever an edge is properly ground, by any means, a metal burr edge is created. 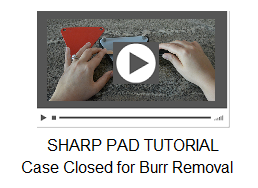 A burr is actually part of the edge and must be removed in a very specific way. If the burr is not removed and removed properly the edge will be dull and only get duller with use. The burr cannot simply be rubbed away without serious damage to the cutting edge and cannot be ground away without creating another burr in it's wake. Professional sharpeners use many different tools and techniques to remove burrs but all these methods are outside the scope and capabilities of the average kitchen chef. That's why we developed SHARP PAD. 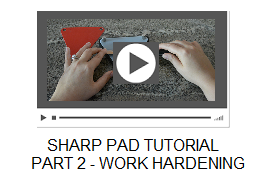 As a matter of fact - many professional sharpeners now use SHARP PAD as their preferred burr removal tool because SHARP PAD not only removes the burr but hardens the edge of kitchen cutlery thereby extending the life of the edge. Professional sharpeners also use one other tool manufactured by Edge On Up, a PT50 Series edge sharpness tester. PT50 edge sharpness testers will not only detect and measure the presence and extent of burrs but also let you know when the burr has been completely removed. Of course that's far from the only thing a PT50 Series edge tester can do for you but its a good place to start. The PT50C is the recommended edge tester for home kitchen use. If you want an Edge On Up guarantee for the creation of sharp, durable edges then team up your SHARP PAD with a PT50C and you have it. we've discovered a lot of things about edge sharpening as a result of our research into edge sharpness testing. The following photo essay demonstrates the basis for our thoughts on grinding edges, burr creation and proper burr removal. The two photos below were taken of the same knife edge, at the same magnification level, but under different circumstances. Image "A" shows a knife edge, ground by traditional means, and then deburred using a SHARP PAD. This knife measured 380 on the BESS (sharpness scale) brand new and then 220 on the BESS (40% sharper) after grinding and deburring. Image "B" shows this same sharpened edge after it was passed through the final stage of an electric sharpener. The crisscross grind marks in image "B" were left on the edge by the spinning abrasive wheels of the electric sharpener. The diagram at left indicates your perspective to the edge. Keep in mind, with image "B", that the burr is rolled toward you and that you are looking at the top of that rolled burr edge. Don't be distracted too much by the shards of metal sticking up from the edge. Yes they are part of the burr and attached to the edge but they are a bit of a "red herring". The white lines point to the real culprit here, the rolled burr. If you were to drag your thumb across this burr edge it would likely leave you with the sensation that the edge was sharp. If this burr is not removed, then, with first usage the flimsy metal burr will be bent down and flat against the side of the knife edge. The resultant "doubling over" of the edge apex will cause the knife to be very dull. So...obviously the burr that was left by the electric sharpener needs to be removed. 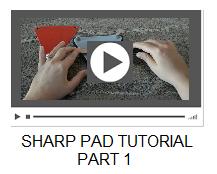 Watch the video SHARP PAD TUTORIAL PART 1 and see not only how the burr is removed from this knife edge but also what its edge sharpness level is both before and after SHARP PAD.